What, exactly, is Canadian cuisine, beyond poutine and Canadian bacon? Well, they have a “selection of Maple Syrup products” (!!!! ), a “British Columbia Burger” (“2 beef patties, 2 slices American cheese, chopped onions and lots of secret sauce”), and a “Canadian Sub” (which features American and Swiss cheese). The whole place is run by Ron W. Babcock, a “Canadian American” who prints the Lord’s Prayer on the back of his business card (just like we do back home!!!). The walls are covered in pictorial tributes to the Great White North (travel posters for beautiful Saskatoon and enticing Yellowknife, etc.) and the sound system plays real Canadian music (kd lang, a kids’ chorus spelling out C-A-N-A-D-A, the national anthem, and—my favorite—Bryan Adams). The colo[u]r scheme is a flag-raising duo of red and white. I was hoping my server would be dressed like a mountie or a moose or beaver, but, alas, she was just a regular gal. 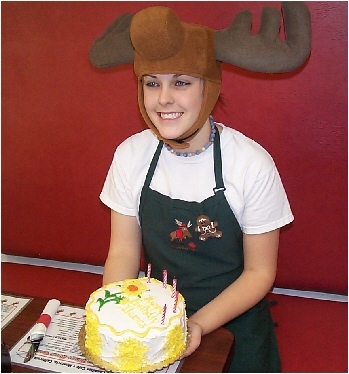 Well (as pictured), they do throw together a moose outfit for people’s birthdays, at the least. Check out their website for an hour or so of good times, or read LAist’s review to see if the Chalet sauce equaled that of Swiss Chalet’s, as promised (it didn’t). Quick, can someone buy us a plane ticket to L.A.? Photo of “Birthday Girl Deanne” from Canadian Cafe’s website.